Watch Prince Harry and Duchess Meghan’s First Public Kiss as a Married Couple! There it is! 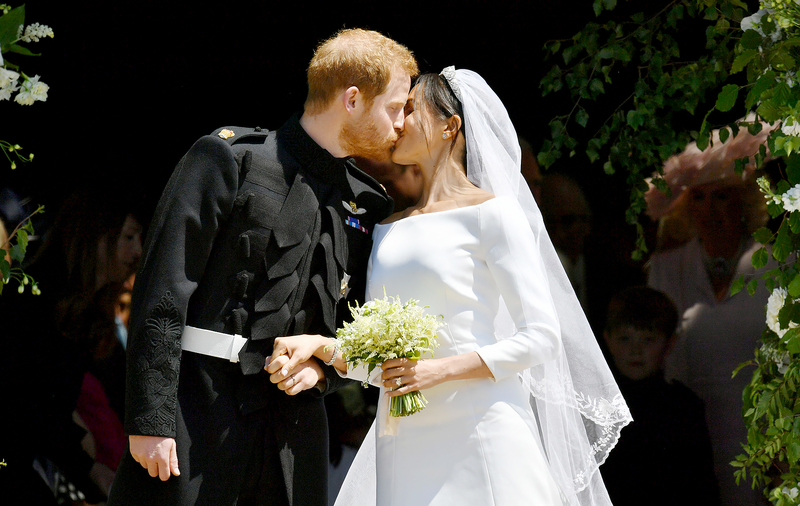 Prince Harry and Duchess Meghan shared their first public kiss as a married couple while leaving their wedding at St George’s Chapel at Windsor Castle on Saturday, May 19. As Harry, 33, and Meghan, 36, walked outside to descend the steps of the castle, she looked over at him and appeared to whisper, “Should we kiss now?” The prince immediately leaned in and gave his bride a sweet peck on the lips as their guests cheered. The newlyweds’ first kiss broke royal tradition. A spokesperson for Kensington Palace confirmed on May 4 that Harry and Meghan would not pose for photos on the balcony of Buckingham Palace, where his brother, Prince William, first locked lips with Duchess Kate after their April 2011 nuptials. Harry and William’s parents, Prince Charles and Princess Diana, also shared their first kiss there in July 1981. Some royal watchers predicted that Harry and Meghan (née Markle) would kiss during their carriage procession around the city of Windsor, while others speculated that it would happen on the steps of Windsor Castle. The former Army helicopter pilot and the Suits alum tied the knot in front of approximately 600 guests earlier on Saturday. Only about 200 friends and family members have been invited to their private reception later in the day at Frogmore House. Harry and Meghan began dating in summer 2016. They announced in November that they were engaged.